Our Back Flow Buddha Incense Burner is the perfect burner for all aromatherapy fans. 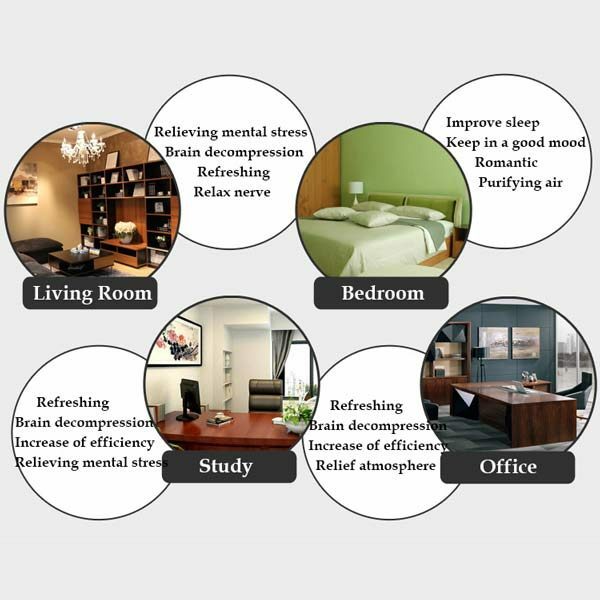 Incense burning for meditation and prayer is an ancient tradition. Burning incense for meditation decreases stress, and its believed that different types of incense – frankincense, sandalwood, and sage – have the power to cleanse negative energy, ease tension, and elevate your meditative state. This Back Flow Buddha Incense Burner has been carefully handmade with ceramic materials. 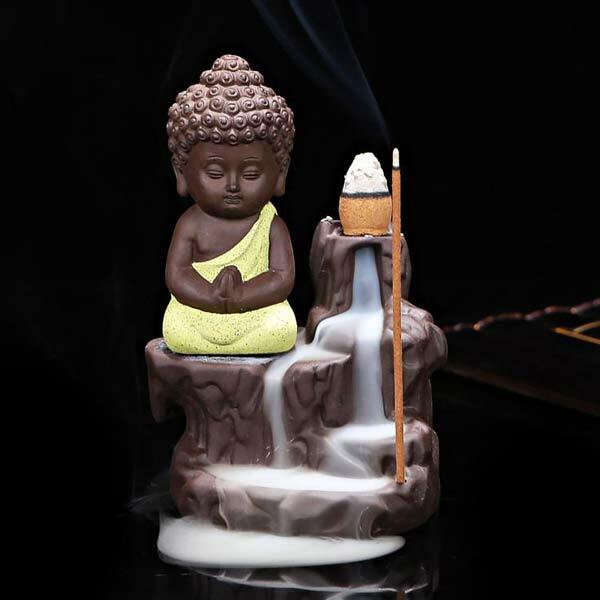 When the incense cone is lit, the aroma and smoke mist will slide down the burner, creating a a cascade like effect! 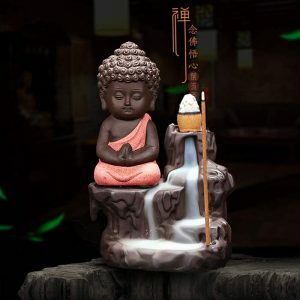 In Buddhism, incense burners, or censers, are used in all Buddhist cultures and denominations. The burning of incense takes place both in the home and in the temple, and serves as an offering to the Buddha or various deities. Lit an Incense Cone and place it in its place in the burner (top right). After the cone has been lit well, an ash will form, which will push the smoke down towards the hole of the incense cone and through the small hole in the Incense Burner, creating the smoke trail that will be giving the waterfall effect. IMPORTANT: The smoke effect can only be accomplished by using Backflow Incense Cones. 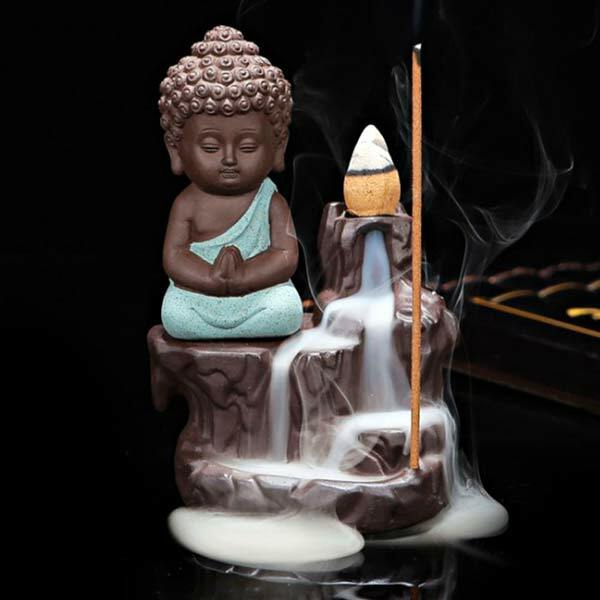 A couple of samples come with the Buddha Incense Burner. If you’d like to buy more, you’ll have the option to do so at the cart page. Beautiful house warming or Griha Pravesh Ceremony.